Since I last wrote I have been 4800 miles by car to Canada and Maine. With my mother in the car we had to stop every 60 miles for "washroom" breaks. But since I got home I started back dyeing my silk scarves. Here's an early batch hanging for audition. If they had too much white space or were too "tie-dye" looking the chances are they have already been overdyed. Yeah.. that mess is my studio. The table is where I lay out my circles for assembly. The other major activity this summer has been to turn my otherwise unused front two rooms of my studio into a micro gallery. I've wanted someplace I could sit down with a prosepctive client and show my work in an elegant manner. 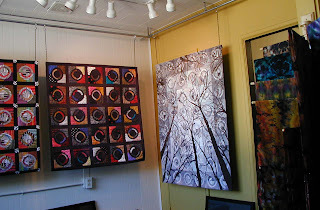 So these three photos show the inside of my "gallery space". On the left side you can see some of my scarves. You can now order scarves directly from me. I'm still trying to figure out how to create an order form. 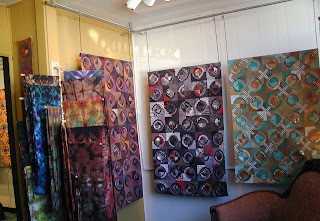 My plan is to focus on wholesale for the scarves plus what I can sell out of my gallery plus online. By the way the size of the scarves is 12" x 60". Most are crepe de chine. Some are habotai. All are over-dyed with black accents. BTW- They have beads on each corner extending about 2.5-3 inches. The added weight of the beads make them very desirable for simply draping around your neck over a sweater, jacket or shirt. The price is $42. The best sellers are the ones in autumn tones, jewel tones, bright red, & bright blue (Not in the same piece) If you have colors you especially like I can choose one for you based on your tastes. I'll happily guarantee your pleasure or return or exchange for another. 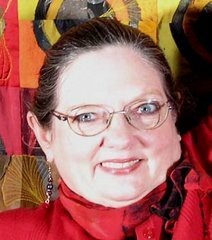 Just call me at 417-274-1561. I'll take most credit cards or your check. Wholesale orders--contact me directly as well. 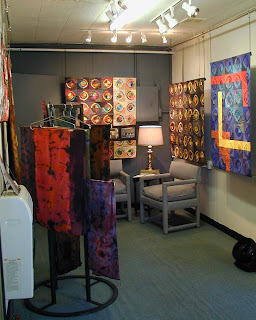 The address of the gallery is 219 Chestnut in Thayer, MO. Now to round three of my 300 block "Visions of Plenty". 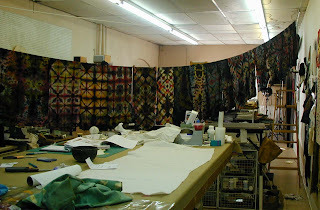 Hopefully next week I'll do "magic time" and you'll begin to see where this quilt is going. So far I am planning for 6 panels each 8 feet tall and totalling 18ft wide. Now where can I exhibit this piece?